Astronomers using the NASA/ESA Hubble Space Telescope have shown for the first time that bursts of star formation have a major impact far beyond the boundaries of their host galaxy. These energetic events can affect galactic gas at distances of up to twenty times greater than the visible size of the galaxy — altering how the galaxy evolves, and how matter and energy is spread throughout the Universe. When galaxies form new stars, they sometimes do so in frantic episodes of activity known as starbursts. These events were commonplace in the early Universe, but are rarer in nearby galaxies. During these bursts, hundreds of millions of stars are born, and their combined effect can drive a powerful wind that travels out of the galaxy. These winds were known to affect their host galaxy — but this new research now shows that they have a significantly greater effect than previously thought. An international team of astronomers observed 20 nearby galaxies, some of which were known to be undergoing a starburst. They found that the winds accompanying these star formation processes were capable of ionising  gas up to 650 000 light-years from the galactic centre — around twenty times further out than the visible size of the galaxy. This is the first direct observational evidence of local starbursts impacting the bulk of the gas around their host galaxy, and has important consequences for how that galaxy continues to evolve and form stars. The team used the Cosmic Origins Spectrograph (COS) instrument  on the NASA/ESA Hubble Space Telescope to analyse light from a mixed sample of starburst and control galaxies. They were able to probe these faint envelopes by exploiting even more distant objects — quasars, the intensely luminous centres of distant galaxies powered by huge black holes. By analysing the light from these quasars after it passed through the foreground galaxies, the team could probe the galaxies themselves. The starburst galaxies within the sample were seen to have large amounts of highly ionised gas in their halos — but the galaxies that were not undergoing a starburst did not. The team found that this ionisation was caused by the energetic winds created alongside newly forming stars. This has consequences for the future of the galaxies hosting the starbursts. 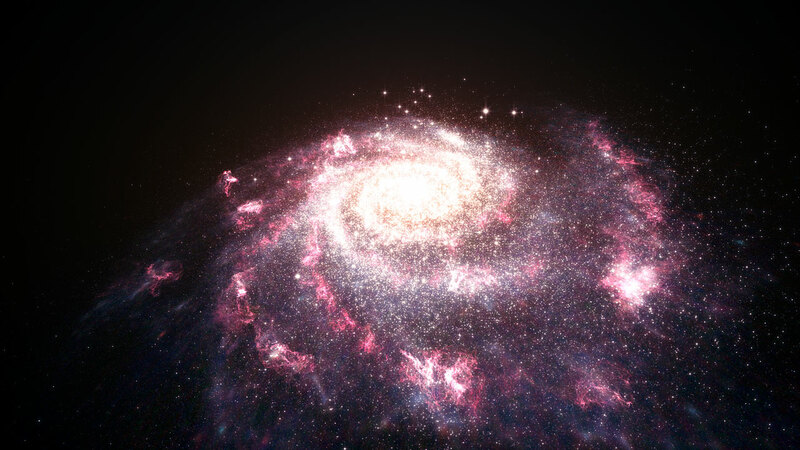 Galaxies grow by accreting gas from the space surrounding them, and converting this gas into stars. As these winds ionise the future fuel reservoir of gas in the galaxy’s envelope, the availability of cool gas falls — regulating any future star formation. The team's results will appear in the 1 May 2013 issue of The Astrophysical Journal. A gas is said to be ionised when its atoms have lost one or more electrons — in this case by energetic winds exciting galactic gas and knocking electrons out of the atoms within. Spectrographs are instruments that break light into its constituent colours and measure the intensity of each colour, revealing information about the object emitting the light — such as its chemical composition, temperature, density, or velocity. The research is presented in a paper entitled “The Impact of Starbursts on the Circumgalactic Medium”, published in the 1 May 2013 issue of The Astrophysical Journal. The international team of astronomers in this study consists of: S. Borthakur (Johns Hopkins University, USA), T. Heckman (Johns Hopkins University, USA), D. Strickland (Johns Hopkins University, USA), V. Wild (University of St. Andrews, UK), D. Schiminovich (Columbia University, USA).